Kite shields might have become common in later eras, but round shields never truly lost their usefulness. 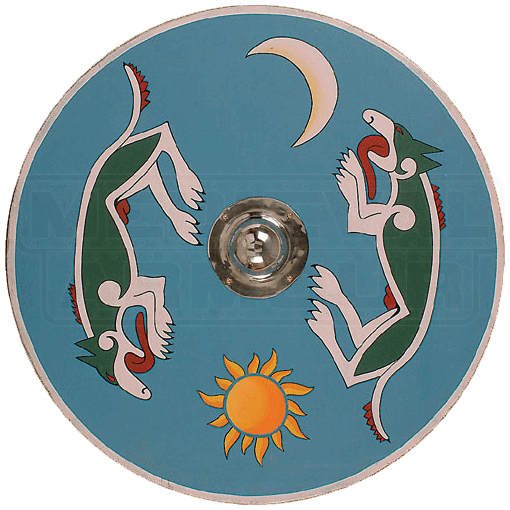 This Wooden Viking Dragon Shield is a decorative piece featuring Viking designs that is modeled after a typical rounded Viking shield. This impressive shield is made from quality hardwoods to ensure a solid level of construction that is ideally suited for display and re-enactment, as well as costume use. The shield features a steel boss at its center, which provides an added measure of defense that helps deflect blows off the shields surface. On either side of the shield boss are two Viking-inspired dragons, represented as four-legged beasts with green and white skin, as well as red frills along their body. At the head of one of the dragons is a white crescent moon, while at the head of the other is a yellow and orange sun. The background of the shields face is a vibrant and shade of light blue. The shield measures approximately 36 inches in diameter. You could carry this shield into battle, although with such a pretty and detailed design, this Wooden Viking Dragon Shield is just as suited for display, where others can admire not only its authentic shape and style but also its impressive design.